I used a screwdriver and gently twisted the blade to lift the cover off. To replace it I used a punch to restake the cover. I purchased new latches and found the same problem, the springs are too tight. The one i fitted to the right hand door came apart while i was driving and i had to refit the cover,verry poor quality. Strange that the return spring does not show in any parts list for the main suppliers. CJD had mentioned having to do the same thing to his latches. Also looks as though there should be something to keep the square shaft from coming out of the lever. Hard to see the spring in your photo but I presume it is the thin line above the horizontal bar? Hey David there is a round push nut with square hole that goes over the shaft and the spring on the outside is long and hooks up in an awkward way. I will try and dig some stuff out tomorrow and try to get a picture. Have you ever purchased anything from Marv? I bet he has some of what you need. He lives down by you somewhere in Alabama . Marv has kinda slowed down on his parting out tr3, but he used to sell them a lot. I bet he still has something with doors. John bought a whole car from him. He has not posted for a while, but I talked to him last week. I will give you his email--- mgruber921@aol.com ----because he is pretty open about selling parts to people on the forum. 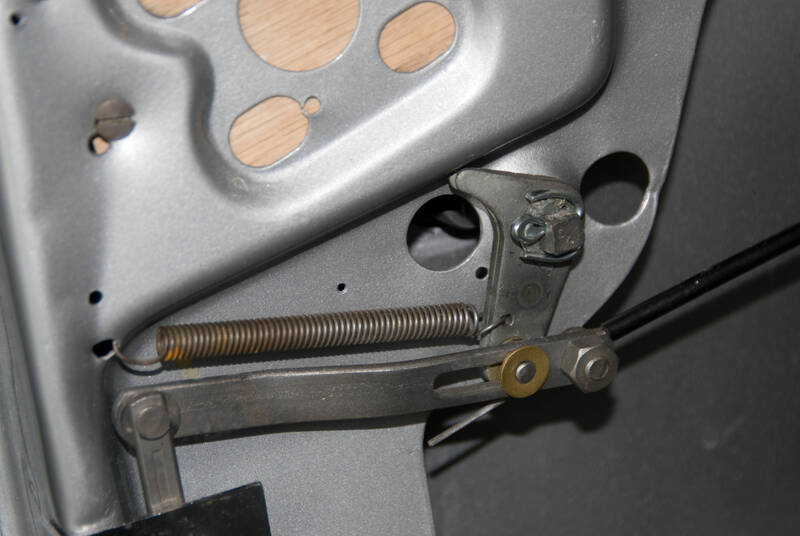 I just set up a spare latch and handle with the clip and an old spring so you can get an idea of how it works. The centre of the lever cam needs to fit all the way into the door frame where the handle shaft comes out. That is very helpful. Thank you. I will give Marv an e mail to see what he has in that area. It still surprises me that there is no mention of these parts in any book or the parts lists put out by the usual vendors. Also it looks like a support on the inner skin of the door would have helped with the handle being a bit more rigid. getting real low on door latch parts. Have 4/5 TR3s left but they are complete cars. Wish someone would cast the pot metal cams that are used in the latch. The spring nut you should able to find similar one inthe Grainger catolog. That odd shaped teardrop piece of pot metal with the raised center holds everything by way of the hole it sets in once the push nut is on and once the 2 screws that hold the handle on are in place everything tightens up; the teardrop part has a raised section that goes in the hole and acts like a bushing. 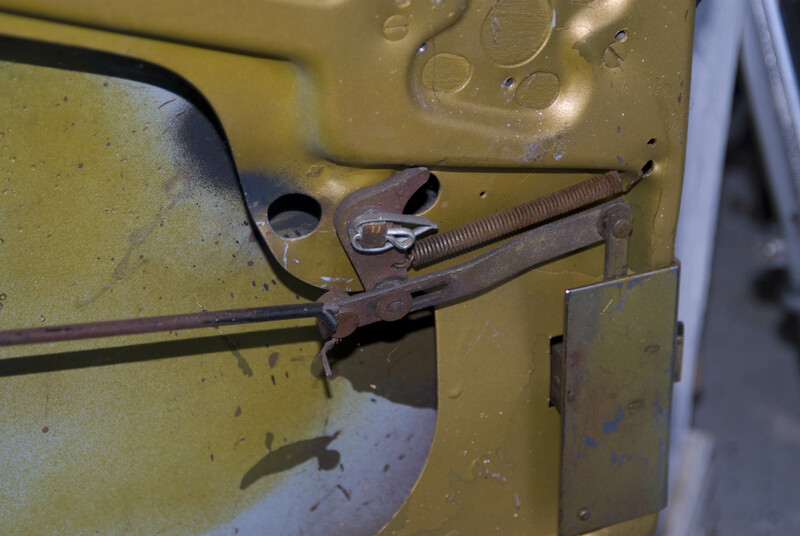 Sorry but,Graham’s spring is not correct; the correct spring is longer more flexible and skinnier- plus there is a small hole in the door frame for one end of the spring to attach and basically get pinched between the door frame and door panel in this awkward little reses. Thank you for the info. I will check Granger and see if my local ACE has something suitable. The spring should be easier. Here are a couple pictures...not at all correct, but they'll give you guys an idea and something to pick on?! Thank you for the photos. I have found a very similar spring in the box of odd parts that came with the car. No clip in the box but I can do the split pin. I notice I need to change the anchor point. I did do a bit of reshaping on the fixed end of the spring. Yes David that anchor point you used i think is for one of the door card screws and yes that spring i showed was just a left over and only to give an idea of what it should be, sorry. Thank you for the photos. Got me headed in the right direction. With the pin like CJD my handle feels nice and firm now. Just have to get the other door to work the same. Got my new heater core today. Looks great, very well made and it includes the shorter clips that hold everything together. When I have tested it I will post photos. The mat in the boot. Glued down or clipped down with the removable studs? I see from the book How to Restore the TR2,3,3A by Roger Williams the main carpets are put down before the seat runners are installed. The carpets that came out of the car had slots cut in them for the runners. The slits in the carpet allow them to be removed after the car gets wet, without having to remove the runners from the floor. If you take the runners loose, they have to be realigned afterwards, which is an annoyance. The slits are invisible with the seat installed. I just punched holes for the seat runner bolts and try not to take it out in the rain without the top up. I think i need to go back to basics with posting phtos the last 3 came out upside down and two of them as thumbnails? So the slits depend on how you intend to use the car. Getting wet do the slits. Have to think about that. I have the pieces that cover the wheel arches and sides as well. I think they could be glued. The wheel arches are glued I didn't use any underfelt or sponge just glued to the metal, the sides or 1/4 panel inners are screwed on.